What's so eco-fantastic about washable nappies? Eight million nappies are thrown away every day in the UK, the majority of which are sent to landfill. 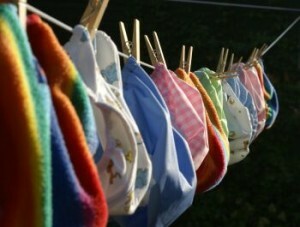 Seven million trees are cut down every year to manufacture disposable nappies - that's four point five trees per child. It also takes a cup of crude oil to produce the plastic for one disposable nappy. These are strong enough statistics to at least nudge a doubtful mum to consider the more labour intensive washable nappy option. So what other benefits do they have to offer? The big one is they are better for your baby. The organic cottoned variety don't contain harmful chemicals and allow the little ones skin to breath. Manufacturers of disposable nappies are not obliged to list their nappy ingredients on the wrapper so you don't always know what you're getting. Washables are cheaper than disposable nappies in the long term. From birth to potty training it can cost you up to £600 more for disposables. Of course you can also change your baby as often as you like at no extra cost. Mums tell us that children in cloth nappies are generally potty trained earlier too; the reason being disposable nappies create an artificially dry environment, so it's more difficult for a child to learn the connection between bladder release and a wet nappy. To further your green baby status, wash your reusable nappies with eco-washing powders and A-rated energy efficiency washing machines to reduce energy and water consumption.